What do you get when you combine a gorgeous fashion model and an amazing beauty product company that’s all about helping make the world a better place? Why, beautiful cruelty-free makeup, of course! 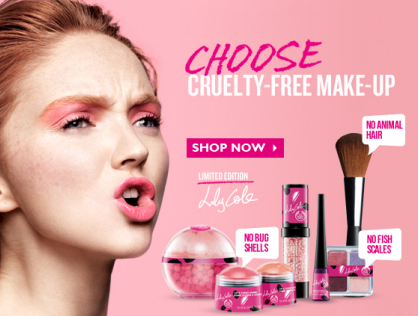 That’s right, activist and model Lily Cole has partnered with The Body Shop to bring you a fabulous line of cruelty-free makeup that does good for the world and looks good on! Believe it or not, there are a lot of shocking things that go into your makeup -- bug shells, fish scales, and animal hair, just to name a few. The sad truth is, tons of beauty products are harming animals to bring you the products you buy... and that’s just not okay! Lily Cole’s Cruelty-Free Collection contains no bug shell extract (which is used to color beauty products), no fish scales (instead, The Body Shop created shimmer products using mineral mica and natural vegetable minerals) and no animal hair (all brushes in this collection are made from artificial hair as opposed to the oft-popular goat hair). Thanks to The Body Shop and Lily Cole, you can wear makeup that is 100% vegan, which means these goodies aren’t harming anyone or anything! Each of the products available are super high-quality and have the ability to make any girl feel as beautiful as supermodel Lily Cole! All the products come in super cute pink and black packaging, plus the not-so-steep prices make these products a go-to for the college girl.